Breaking Bad: Why the sub-2 hour marathon attempt doesn’t excite me. Remember when the marathon was a race and not a carefully contrived science experiment? Monday’s announcement of the “audacious” Breaking2 Project, a Nike-funded initiative aimed at putting a man under 2 hours for the first time in history next spring, marks the latest attempt at manufacturing a spectacle that bastardizes the spirit of competition that makes a marathon…well, a marathon. I’ve written about my distaste for these one-off endeavors once or twice in previous issues of the morning shakeout, and I haven’t budged on my stance. Whether you’re a perennial world-beater or a first-timer just trying to get to the finish line, there’s a rawness to marathoning that makes the race so special: runners testing themselves against other runners, unique courses and whatever elements mother nature decides to throw their way. At the end of the day, sometimes the clock cooperates and other times it doesn’t, but hey, that’s racing. What Nike — and Yannis Pitsiladis’ Sub2 Project — are trying to do (independent of one another), is not racing. It’s a mockery of it. These two stunts are exactly that and, in both cases, Nike and Pitsiladis are using athletes to fulfill their own desires. Kenenisa Bekele didn’t go to Yannis Pitsiladis and say, “I want to break the 2-hour marathon, help me do it” just as I’d be willing to bet neither Eliud Kipchoge, Zersenay Tadese, nor Lelisa Desisa approached Nike with the idea for this latest project. But if Bekele sneaks under 2 hours running alongside the Dead Sea or Kipchoge breaks the 2-hour marathon on a custom-made treadmill in an oxygen-rich chamber 50 meters below sea level (because why the hell not? ), the conversation for centuries afterward is as much about the instigators of the idea as much as it is the executors of the experiment. Does anyone remember when Kenyan Elisha Korir broke 26 minutes for 10K in 2008? I sure didn’t—and that was at the height of my running geekdom—until I saw this Tweet from Steve Magness a little while ago. Why? I’d argue because it was a manufactured attempt complete with spring-loaded shoes (which Ross Tucker of The Sports Scientists says would be necessary for a 2:04 marathoner to go sub-2) and a downhill race course. 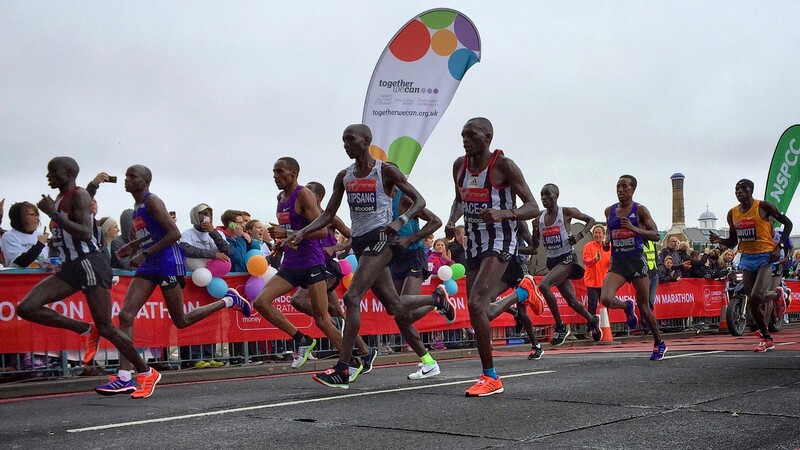 The marathon as we know it has been around for over a hundred years, following a very consistent format since the event was first introduced at the Olympics in 1896: first person to the finish line wins. And while those winning times have dropped over the years as competition, equipment, courses and training methods have all improved, not to mention the introduction of pacers (and, let’s be honest, performance-enhancing drugs), the spirit of the marathon as a race has mostly stood the test of time. I’m not against chasing world records or breaking barriers but let them happen in an established environment as a result of runners pushing one another to never before achieved levels of performance. That’s why I can get excited about Geoffrey Mutai running a 2:03:02 at Boston or Dennis Kimetto going sub-2:03 in Berlin. There’s a history to those events that helps me appreciate the magnitude of the performance when a small chunk of time gets taken off the previous best mark. A carefully orchestrated attempt at an arbitrary barrier in a sterile environment by a limited number of handpicked participants who belong to one brand just doesn’t excite me. Heck, even when Roger Bannister broke the 4-minute mile — a watershed moment in running history the sub-2 hour marathon seeks to emulate—he did it at an annual dual meet “when the wind was fierce” despite the knowledge that “a good track, absence of wind, warm weather and even-paced running” would give him the best possible chance of breaking the vaunted barrier. Sure, his teammates paced him a good chunk of the way but the extraordinary achievement was accomplished in an ordinary situation no different than the annual scenario at the Berlin Marathon, site of Kimetto’s two-year-old mark of 2:02:57. My own lack of excitement for a special sub-2 hour attempt aside, I’m skeptical on just how much positive press these two well-funded science experiments will bring to the sport. As Toni Reavis wrote Monday, allegations and findings of massive drug use “has soured the public on the sport to the point of dismissal and disinterest.” And like or not, regardless of how transparent organizers try to be, suspicions of performance-enhancing drug use will hover over both sub-2 hour projects as long as they’re in existence. Because where does it stop when you’re pulling out all the stops? Ed Caesar, subscriber to the morning shakeout and author of the excellent Two Hours: The Quest To Run The Impossible Marathon, is reporting on the Nike project for wired.com and will be writing about his own experience attempting to run under 90 minutes for the half marathon using the same resources available to Kipchoge, Tadese and Desisa. I’m looking forward to following his dispatches over the coming months. Ed challenged one of my Tweets on Monday and is far more optimistic about the project than I am at this point. “I’ve got no idea if it will work,” he wrote. “I think process could be joyful, and a way to connect more people to pro running.” I’ll be speaking to Ed in the coming weeks and hope to share the details of that conversation with all of you when I do. “BUT, this situation is not athletics,” famed Italian coach Renato Canova said of a special sub-2 hour marathon attempt in a 2-part interview for letsrun.com. Good perspective, and insight, on what it would take to go sub-2 from one of the best minds in the sport. This post first appeared in the morning shakeout—presented this month by Tracksmith—my weekly email newsletter covering running, media and other topics that interest me. If you’d like for it to land in your inbox first thing on Tuesday mornings, subscribe here. writer of the morning shakeout. biting off more than I can chew since 1982.